Sorry for the lack of posts last week I was on vacation and really disconnected. My family and I spent 3 days laid out at the beach, so please excuse all my tan lines. 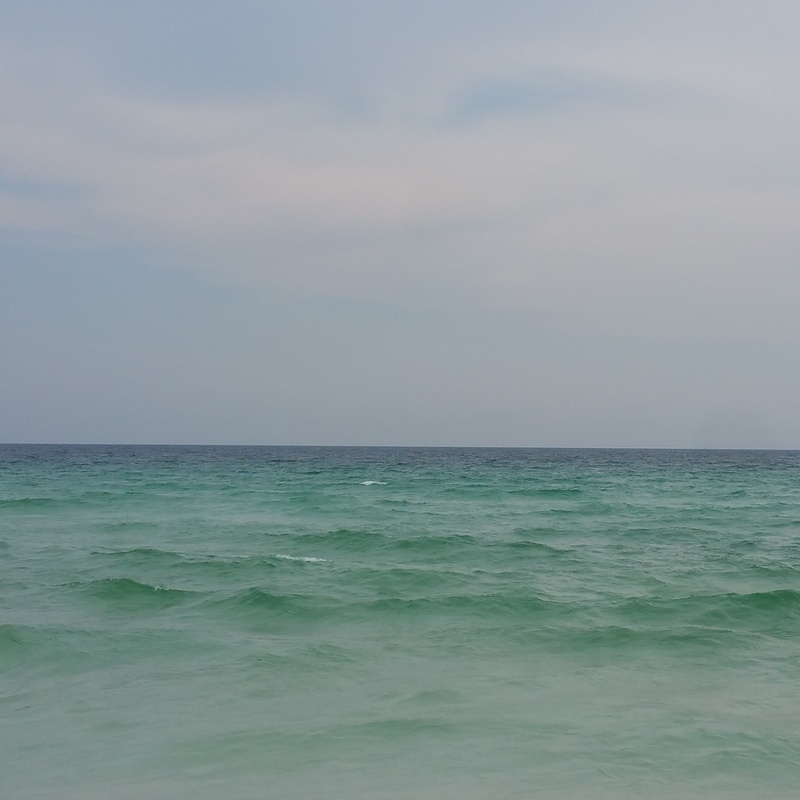 I did post a few beach pics to my Instagram so be sure to follow me there. 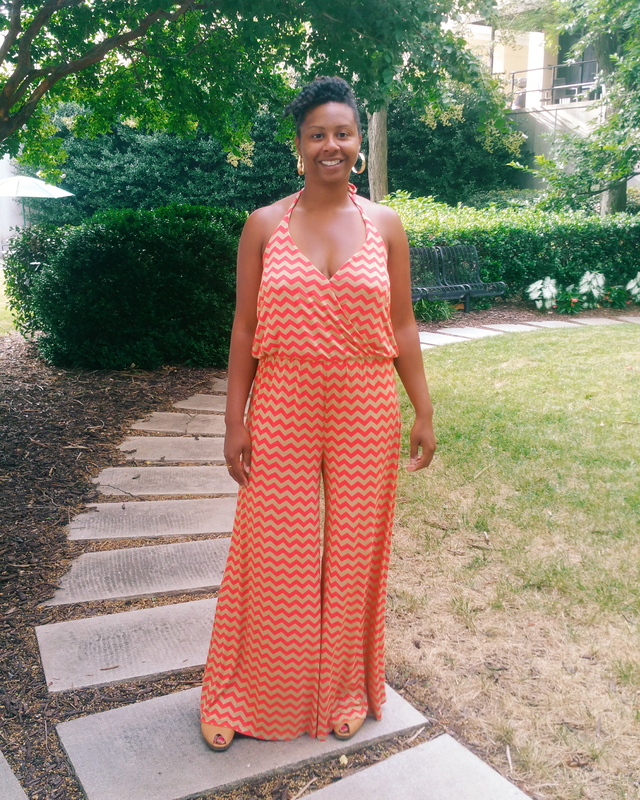 Today I’m sharing a jumpsuit I managed to sew up before I left because I felt it it would be great at the beach and I was right. It is so comfortable and catches the ocean breeze nicely. 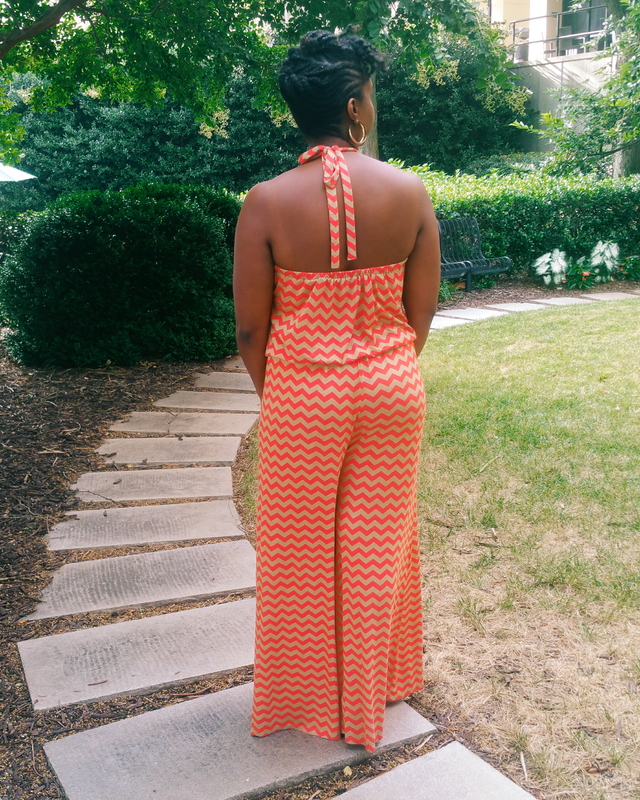 When Vogue came out with this pattern I tried to convince myself I didn’t need yet another jumpsuit pattern. I reasoned with myself that I could simply self draft a faux wrap top to attach to the palazzo pants from NL6735. I was right, as usual-lol, but I broke down and bought the pattern anyway. Despite the fact that I need to continue working on self drafting, I’m glad I purchased V9116. It is a quick sew, stylish and comfy. I feel in love with this orange and gold chevron jersey when I first saw it. I’m not sure why, maybe because the gold really has a shimmer like a metallic gold even though it’s not. Anyway I had purchased 3 yards of this jersey fabric to make M7121 for myself and to make a mini version for my daughter. However after I broke down and purchased V9116 I knew that I would try to squeeze all the pieces on the 3 yards of this fabric. Thankfully it worked! 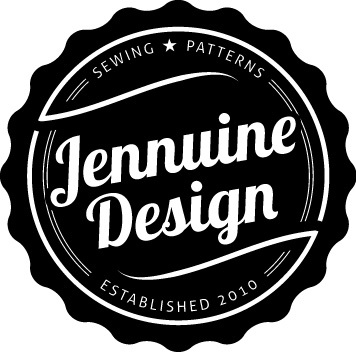 Due to the lack of finished measurements I had to guess at sizing based on my experience with Vogue patterns and other sewistas reviews. I typically wear a 12 from Vogue, but because I read several comments that the bodice ran large I cut a 10 bodice and 12 pant. This worked out ok although it is a tad snug across the back and underarm. I’m not sure if this is because I cut the size 10 or because I didn’t follow the elastic back guide. Either way it is wearable. I didn’t really follow the instructions but I read them and they seemed very straight forward. 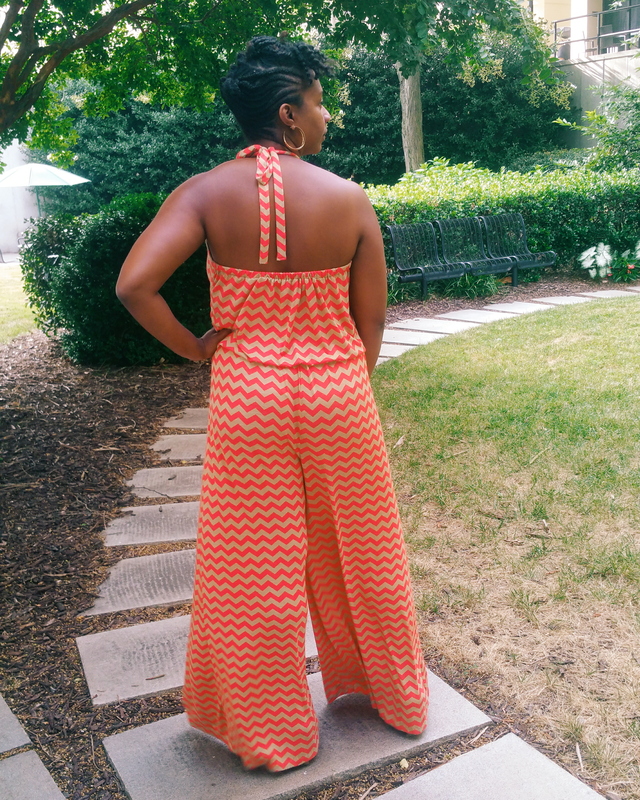 I would recommend this pattern to anyone who likes this wide legged jumpsuit look. To make up for skimping on a possible self-drafting lesson I have promised myself that I will self draft a bra friendly back piece for my next version. Keep reading for my pattern review. 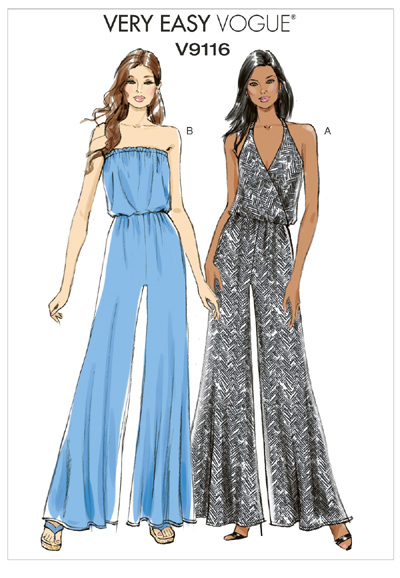 Pattern Description: Wide-legged jumpsuit has very loose-fitting, blouson bodice, and narrow hem. A: Mock-wrap, self-lined bodice, and tie ends. Upper back A, upper edge B and waist A, B: Elasticized. Does it look like the photo/drawing on the pattern envelope? Yes! Were the instructions easy to follow? Extremely easy! Likes: I’m loving jumpsuits right now. I love the self-lined bodice and the ease of construction. It is also very comfortable. Dislikes: I didn’t love that there were no finished measurements. 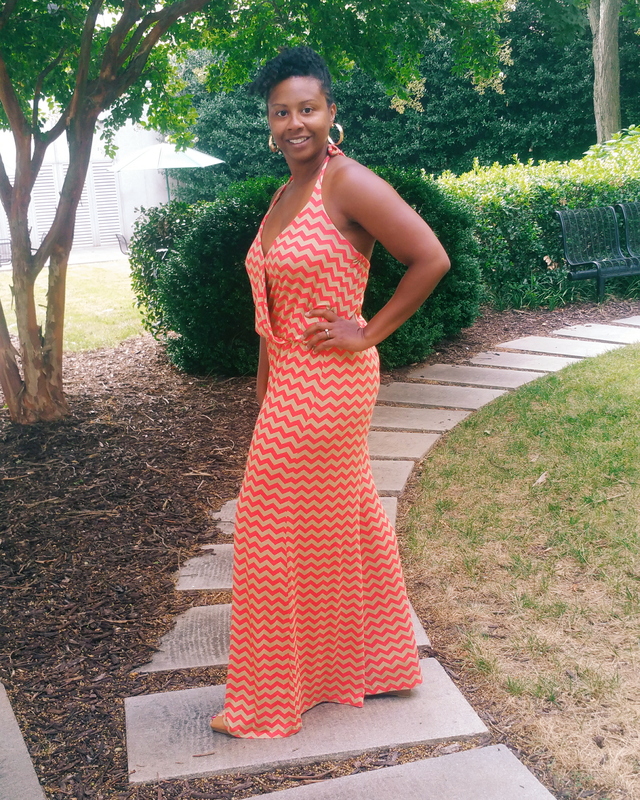 Conclusion: Great quick to sew jumpsuit that will work in the summer and transition to fall. Very nice style and fabric. Fits you well also. You’re so sweet. Thank you. I’m a recent convert myself. I think you should try it!